Find out what Xur is selling for December 1, 2017, Week 13. This is the second last week of the ordinary Xur we’ve come to love in Destiny 2. Starting the week of December 12, after the launch of Curse of Osiris, Xur will be stocking a few extra items – according to the recent Bungie blog, The State of Destiny 2. If you’re wondering what Xur is selling, then wonder no longer, because we’ve got the information you’re looking for! This week, Xur can be found in the EDZ in the Winding Cove. Use the fast travel node in the Winding Cove and head north toward the cliffs. Xur is up near the crashed Fallen Skiff. 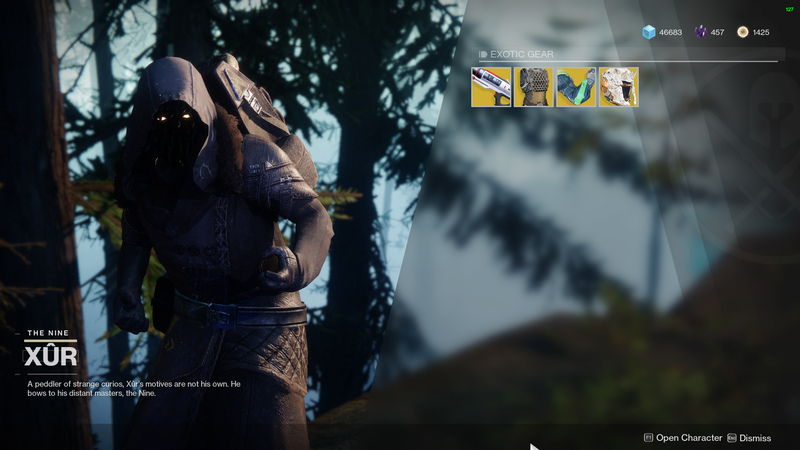 Xur’s habit of bringing one Exotic weapon and three Exotic pieces of armor remains the same. Each piece of armor will set you back 23 Legendary Shards while the Exotic weapon costs 29 Legendary Shards. If you’re still looking to level up fast in Destiny 2, purchasing gear from Xur is a great way of breaking through the 265 Power soft cap. What Should You Buy From Xur? Definitely consider picking up Sweet Business – it’s a fantastic Auto Rifle that comes in handy during the Calus fight in the Leviathan raid. If you can afford them, and don’t already own them, grab the armor for all the classes, especially the Synthoceps if you’re a Titan and love punching. After you finish buying from Xur, take a look at our Destiny 2 Complete Strategy Guide for more information, tips, and hints. You’ll find guides on every single activity in the game, for both PVE and PVP activities.